It is normal to see some weeds in the lawn. Some of the common weeds that grow in lawns and gardens are broad leaf weeds such as clover and ground ivy (creeping Charlie), dandelions, crab grass, sorrel, nettles, dock, cheapskate, sowthistles, sonchus oleraceus and S. asper (Asteraceae), etc. Not all lawns have the same type of weeds. It is wise to control the weeds as soon as they appear in the lawn. Just one dandelion plant makes up to 15,000 seeds, each of which can create 15,000 more seeds when it sprouts and matures. The dandelion weed can survive up to six years in the soil. Similarly a single sonchus oleraceus plant can produce up to 8 000 seeds which may germinate after rainfall. I have a small lawn (about 10mx6m) in my front side and another (15mx5m) in my backyard. About 8 years ago both the lawns were looking healthy and lush green. I used to water them frequently, but not deeply. About 3 years ago some weeds started to appear, which I used to hand picked them. After some time the weeds started to multiply quickly, so I sprayed pyrethrum weed killer on the weeds. 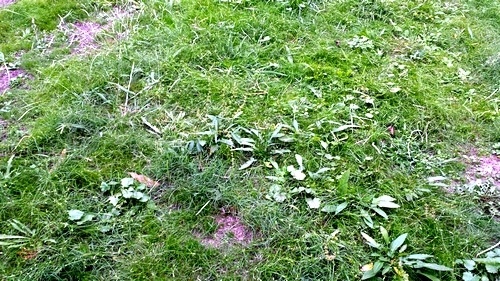 The weeds were killed but the lawns were also damaged very badly, resulting in dead large patches at several places. I became very sad because I had damaged the lawns due to my lack of knowledge. Following rains, the patches again grew up but with some weeds. Because of my negligence of the lawn, the weeds matured and produced flowers and then seeds. The seeds again grew into new weed plants so now my lawns are full of weed patches. Lawn weeds clover and ground ivy, dandelions, crab grass, sorrel, etc. I sprayed weed-and-feed on the lawns. To my surprise, the weeds instead of being killed, they completely took over the lawn. Both the lawns, once healthy, now contain several thick weed areas. The one of the lawns is covered with carpet like fountain grass (Pennisetum spp.) weed which is difficult to mow even with a good mower blade. This grass flowered and produced many seeds and has become tough-to-control weed. My mistake was that when the lawns had empty patches, I should have sown lawn seeds there because the denser the lawn, lesser are the chances of weeds to grow. Now that I have done lot of research on the subject, I will fight the weeds according to the following options. Mow higher usually between 2 and 4 inches. Mowing too low lets light reach the soil, which helps various seeds like crabgrass and goosegrass to sprout and grow., while the longer grass shades the ground, keeping it cooler and retarding germination of weed seeds. The taller lawn also does not allow much sunlight to the sprouted weeds. If the number of weeds are small, then hand-weeding is the best defence on small lawns. Pulling them when they are young is easier, otherwise they will be hard to pull once they mature. Also you should pull the weeds before they flower and seed to prevent them from spreading. Once the weeds with their roots are out, put in some compost and sow some lawn seeds in the area. The only way to get rid of oxalis weeds is to carefully pull them out with their main bulbs and tiny bulblets. Water grass infrequently but deeply, about 1 inch of water per week. Too often light watering do not grows deep roots. Also it helps to germinate weed seeds of crabgrass, chickweed, sedges, Bermuda grass, quackgrass and other weeds. Fertilize correctly by following the application rates on the package. Too much fertilizer helps certain weeds such as annual bluegrass, Bermuda grass and crabgrass, while too little fertilizer can weaken the lawn that loses the competition with weeds. A slow release nitrogen fertilizer provides a slow and steady nutrient supply. The best way to control weeds is to grow a thick, vigorous lawn. Dense grass blocks the sunlight which the seeds of weeds need to germinate. The use of herbicides is recommended when nothing else works and your lawn is completely overrun by weeds. Choose a herbicide that is safe for your turf and the weeds you have, otherwise herbicides can injure or kill the turf. There are weed-and-feed products that combine fertilizer and herbicides to do two jobs at once. Follow the instructions very carefully. Also the chemical weed killers can be dangerous to turf, people and pets if not used correctly. Homemade weed killers may not be safe for grass/lawns. If the broad leaf weeds are in a few isolated places, then a small pressure sprayer can be used to kill them. Wear a rubber glove and then a cloth glove over it. Now make a concentrated solution of Roundup or any other “nonselective” herbicide and dip your fingers in it. Then simply hold the grass blades near the base and pull your fingers outside wiping the plant killer all over the grass.